I don't know if you've heard any of the stories about what happened in Nashville at the Country Music Marathon, but for me, it turned out to be the best race I've had yet!!! We started the race under a tornado watch, which turned into a warning. We knew there was a chance they would have to cut the race short and take us off of the course early, but we were hopeful we'd get a break in the weather and be able to finish. I was running about two minutes ahead of my pace at mile 5, but knew there were a lot of difficult miles ahead. We were on a part of the course where the front part of the group turns and runs back past the runners behind them. I had been thinking about the inspiration dinner the previous night, and one of our team members, Mallory Chandler, from the Atlanta team who I have become friends with and was running her first marathon in Nashville. Somewhere around mile 7, I saw Mallory running the other direction, heading onto the part of the course I had just been on, so I decided to turn around and run with her!!! Long story short, we ran the rest of the race together. IT WAS AMAZING!!! I had more fun and felt reconnected with why I started doing this in the first place. Mallory had a great time!! I would run ahead and get groups of spectators or cheerleaders to chant her name “Mal or E, Mal or E, Mal or E!”, she would smile and laugh and it helped her get through some of the difficult times in the race. One of the Atlanta coaches joined us around mile 10 and we all finished the race together (they closed the course just around mile 21 due to weather and made us go to the finish line). Mallory was so excited to have finished, and for me, it made what could have been a disappointment in a shortened course into one of the most rewarding things I have ever been a part of. To top it all off, later that night a group of us went out and I talked the band into letting Mallory and me come up on the stage in front of several hundred people and announce her accomplishment and anniversary!!! We all have different reasons for why we're participating, and even though the event didn't go off like we all wanted, it turned out to be an incredible event nonetheless!! Thank you, Mary, and Ana so much for being part of our team, you have a great family and I'm thankful we've become friends. Mallory Chandler celebrated her seventh year anniversary as a survivor at the 2010 Country Music Marathon. She is also set to do the 2010 Chicago Marathon with Team In Training. Experience what makes the Nike Women's Marathon so unique and join Team In Training for an afternoon of indulgence and pampering. All attending will be given a complimentary pass to come back and try out Atlanta’s premier workout facility. There will be a tour of the club starting at 1:30pm. Train with TNT to run or walk a full or half marathon on October 17, 2010. It's the weekend when 20,000 women come to the City by the Bay for an awesome experience! Experience what makes the Nike Women's Marathon so unique. TNT alumni! To commemorate the 7th anniversary of this race, TNT is offering you a special $700 discount on the fundraising minimum. This is a unique opportunity to be a part of the team again, regardless if you are a returning Nike participant, or are looking to complete your Triple Crown! New airfare/no airfare options are also being offered. Train with TNT for the Nike Women's Marathon, a Race to Benefit The Leukemia & Lymphoma Society. Have the time of your life and help cancer patients live better, longer lives. To learn more, call the TNT staff at (404) 720-7842. A few months ago in this blog one of our coaches – Joanna Berentsen – applied some of the rules of endurance-event training to the world of dating. Amazingly there were several places where preparing for a run also helped with navigating the dating world. It’s All About Pacing – Planning a wedding does not happen in a few hours. Each decision deserves careful consideration, so create a schedule that allows for that. The venue, the menu, the dress, the vows, etc. This has the added bonus of ensuring you will never hear a phrase like: "What about the dress? You said you were going to handle that. Didn’t you?" Nothing New the Week Leading to the Wedding – This is a time to take some deep breaths and be in the moment. This is not the week to start a 5AM boot camp, ab-busting Pilates class. Or break down and try raw Blowfish. Or try riding a dirt bike. A big part of your life for the last few months has been planning this wedding – why jeopardize it? Speaking of food, take it easy this week. Try not to take in too much junk, rich food, alcohol or caffeine. X-nay on the Red Bull. Get some simple carbs, fresh fruit, steamed veggies – you know the drill. And hydrate. Keep a water bottle at hand and sip all through the day. You don’t get to lie on the couch, however. Get some relaxing walks in to de-stress and be outdoors. If you are in the gym every week, keep it up but back down the intensity. You don’t want to risk injury at this point. Nothing New on Event Day – This is an extension of the advice for the week but with your wedding on the day’s schedule you don’t want to derail yourself. Even if it’s your regular day pass on the exercise class. No funky food. No Jell-O shooters at the bridesmaids’ breakfast. Maybe a sip of champagne. Maybe. Consider saving the bubbly for the reception. Go easy on the fiber, too. I’ve never seen anyone call a timeout during their vows and make that awkward walk to the facilities, but I’m sure it’s happened. In the same spirit be sensible on the fluid intake. On a beautiful Spring morning, little ones lined up at the start barely able to contain their feet. All it took was my saying "Are you ready to run?" and they took off before any of us expected. It had all of the adults standing by laughing uncontrollably. 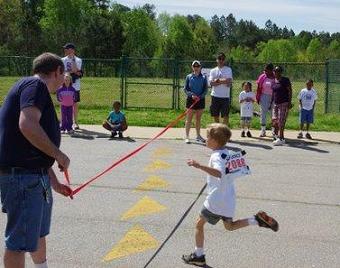 That is how the First Annual Tot Trot held on April 10, 2010 started. Almost 40 kids ages two through ten and their families attended the inaugural event. Following the races, everyone gathered to enjoy pizza, bid on fantastic silent auction items and savor the wonderful bake sale goodies. What began as an idea to gather kids for fun, food and fundraising became a great group effort on the part of the Country Music team. That effort paid off with over $2,000 raised!!! With that kind of incentive, we are all looking forward to an even bigger event next year. Tricia Hernandez is the Honored Hero for the 2010 Country Music Marathon & 1/2 Marathon TEAM and she spearheaded the inaugural Tot Trot for a Cure in benefit of Team In Training. 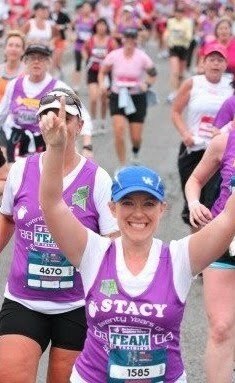 Thanks Tricia, the entire Country Music Marathon & Half-Marathon team and all of the volunteers and alumni that supported! A lot of people come to Team In Training as a result of a close friend or family member who has blood cancer. A lot are even survivors. There is a whole other contingent of people who are considering training for their first ever endurance event and don’t know if they can do it on their own. My story is a little bit different. I fell in love with running when I was quitting a 2-pack-a-day smoking habit. On April 1 five years ago, I was a heavy smoker and pretty sedentary. I started having serious problems dealing with stress driving home from work in the evening. I was quite a heavy smoker in the car and it helped me deal with the traffic. Absent the smoke, I didn’t know what to do until a friend suggested I try running. I had no gear then, no running shoes and no technical clothes, just an old pair of Reeboks and some soccer shorts. That first run only lasted about 10 minutes and I was hurting. When I was done with it though a funny thing had happened; my stress was a little relieved. The days went by and I kept smoke free and running. Soon I ran a 5K race and then a 10K race. Before I knew it I had registered for the 2006 Disney Marathon and was actively training for it. Of course, I met the injury monster for the first time. I hurt my hip and my knee and had to withdraw. It was a pretty serious downer and I stayed off running for four or five months. And then I came back with a vengeance. 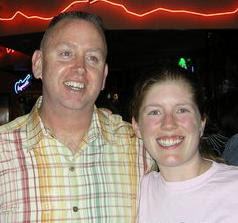 Less than a year after my first injury I ran the Las Vegas Marathon in December of 2006. This was followed by the inaugural ING Georgia Marathon in 2007 and the Vermont City Marathon in Burlington just a few months later. Three marathons in no time at all - I was cruising for sure. I put my name in to the lottery for the NYC Marathon and the streak kept going as I got in. You guessed it. The injury monster struck again; the left foot this time. This one was much worse too. I went into a walking boot in the fall of 2007 and stayed in it for week. I stayed out of running shoes for almost the first half of 2008. When I finally laced back up I was scared that I wouldn’t be able to do it again. Running had become such a part of my life and I couldn’t stomach not doing it again. 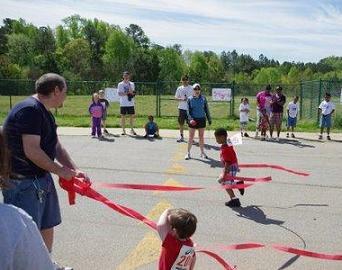 I ran the Big Peach Fall Five Miler in late 2008 and it was my test case. If I did okay I was going to give a half marathon a whirl. I was scared though. No doubt about it. For some reason I still don’t really know, I talked to the people manning the Team In Training booth and signed the sheet. Then I walked away and forgot about it. I forgot about it, that is, until about two weeks later. I was sitting at my desk literally staring at the ING Georgia Marathon course when my phone rang. It was someone from the TNT office wondering if I was interested in signing up. In that moment it all made sense. I wanted so bad to try a marathon again, but I was scared and didn’t know if I could do it. The idea of having a team behind me was so appealing, I agreed to sign up right then and there. The TNT office emailed me the paperwork and I faxed it back within the hour. So I came to Team In Training looking for support, and looking for help getting back this thing that I loved, distance running. And boy did I find it. That 2009 ING Georgia Marathon team was amazing. The support, the friendship, the training plan – everything clicked together. I ran that race, two months shy of two years after my last marathon in a personal record and I got hooked on TNT. I got hooked on the people and the cause. If you stick around TNT it won’t take long for the cause of finding a cure for blood cancers to become personal. So many survivors and families are part of the TNT family, and you make so many friends doing TNT that there really is no way it can’t become personal. After finishing the ING Georgia Marathon, I almost immediately signed up for Marine Corps Marathon and ran that in 2009 as well with TNT. I was rewarded with amazing friendships and a pretty damn cool medal for that endeavor. And now I am preparing to run the Rock ‘n’ Roll San Diego Marathon as a mentor for Team In Training, trying to do my part to carry on the amazing support that Erin, my first mentor, and Ken, my second mentor gave me. I’ll be back for more too. I might take some time off; I’ve fallen in love with trail running you see, and I want to try my hand at some ultra-marathons, but I will be back. Once the TNT bug bit me, there really is no doubt. James Hervey is a two-time Team In Training alumnus and is now mentoring on the 2010 Rock ‘n’ Roll San Diego Marathon team. James is an avid blogger and you can visit his blog at http://thearcoftime.com/. 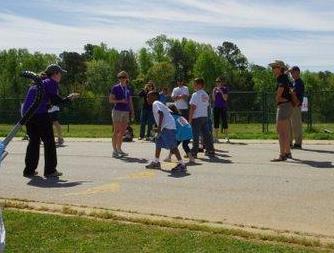 With no children of his own and the desire to make a difference, Atlanta physician Richard Ellin reached out to Big Brothers/Big Sisters of Gwinnett County. In 1996, he became big brother to 7-year-old Aaron LaRue, who was being raised by his grandmother. While the average BBBS relationship is about five years, Richard and Aaron stayed close, even when the youngster moved to North Carolina. Richard has done America’s Most Beautiful Bike Ride with TNT several times, and was actually thinking about passing on the 2010 edition. But late last year Aaron, now a junior exercise physiology major at Wake Forest University and top high jumper on the Demon Deacons track team, told his big brother he wanted the two of them to do a cycling event together. “When he said he wanted to join me on the ride I changed my plans,” Ellin said. So while Richard is training with the Atlanta Team In Training cycling team, Aaron is putting his miles in with the Western North Carolina Team In Training chapter. “Demon Deacon and Doc” will take on the America’s Most Beautiful Bike Ride at Lake Tahoe on June 6. An avid cyclist for several years, Richard Ellin saw the opportunity to use his avocation to raise money to fight leukemia, lymphoma and other blood cancers. He joined Team In Training in 2004 and has ridden the America's Most Beautiful Bike Ride every year with the team since then. Check out team Demon Deacon and Doc's TNT web page here.